We moved my mum into her new sheltered accommodation last week. It is a lovely modern studio flat, where she has her own kitchen and bathroom and a key to her own front door. It is so much nicer than her long, dark, narrow, crabby old flat which she had been living in for the last 40 odd years. The trouble with living somewhere for so long, is that, without even realising it, you accumulate lots of ‘stuff’. Ornaments, and tacky souvenirs that family members have brought back from holidays; photographs in broken frames; pictures; lots of tapestries that mum had done herself years ago; CDs and cassettes; very old records; programmes from long-seen shows; and many, many, years worth of birthday cards (‘I can’t throw them away, they’re too nice’). Of course, moving into a smaller flat meant that she couldn’t take much with her, not even all her furniture, and it’s been down to my sister and I to encourage, co-erce, and downright nag her into leaving much of it behind. Sadly, what seems to us to be old tat, was to her much-loved possessions that were proof of a full and long-lived life. When I look around my own home, I can see that a lot of the things that I hold dear would, quite likely, seem like ‘old tat’ to others. But every piece has a memory attached. Who bought it, why and when. When I dust I caress each piece like a long lost friend, and every plant is loved and nurtured like a child. Sitting here, I can look up and see photos of my children, a vase bought for me by my husband for one of our anniversaries, a moving fish that my daughter made in woodwork class years and years ago, the remains of a hookah pipe bought on our honeymoon in Turkey nearly 30 years ago, a slate rabbit from a mine in Wales, and a small wooden Buddha bought on our first trip to India. Now they nestle alongside some brass candlesticks rescued from my mum’s old flat. I didn’t rescue much, just the candlesticks (which I remember sitting on the mantelpiece back when I was growing up), a couple of ornamental plates that we bought for her on trips to Turkey and Greece, a small wooden elephant, and some finger cymbals that I found in a box and had no idea she had. Heaven only knows where she got them, or why – perhaps a relic of a belly dancing phase of her life that none of us knew about? Hehee..I’d like to think so! The only other thing that I took was an enormous suitcase full of old photographs. There are lots of odd weddings with bride and grooms that I barely recognise, many of them now long dead. 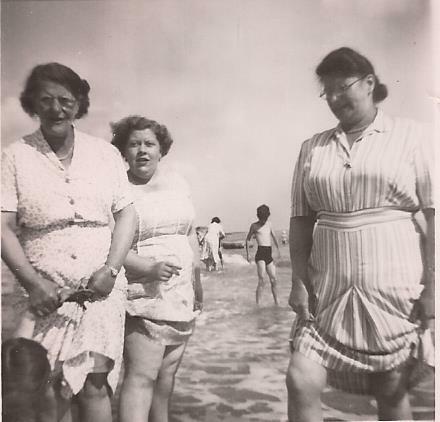 There are pictures of my grandmother as a young woman sitting alongside her mum who I never knew, or paddling in the sea in 1951 with her sister and a friend, all of them clutching their skirts above their knees to stop them getting wet. Of course, there are also lots of pictures of my mum. 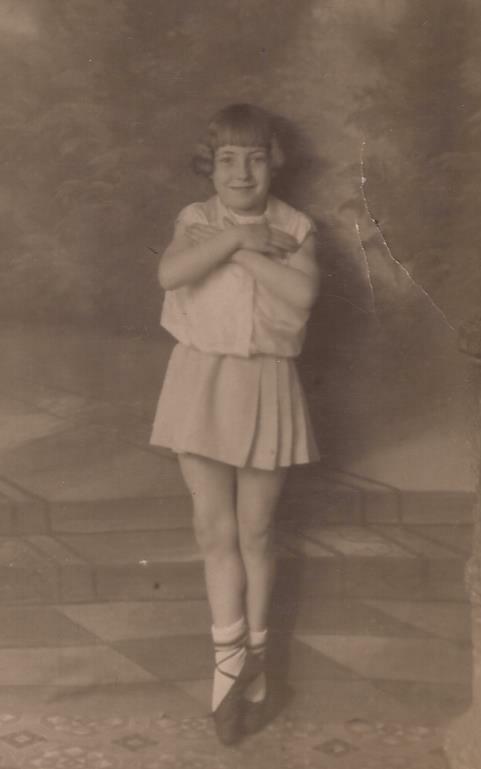 She’s there as a child with a big doll, and another very formal shot where she’s posing in a ballet position aged about nine. 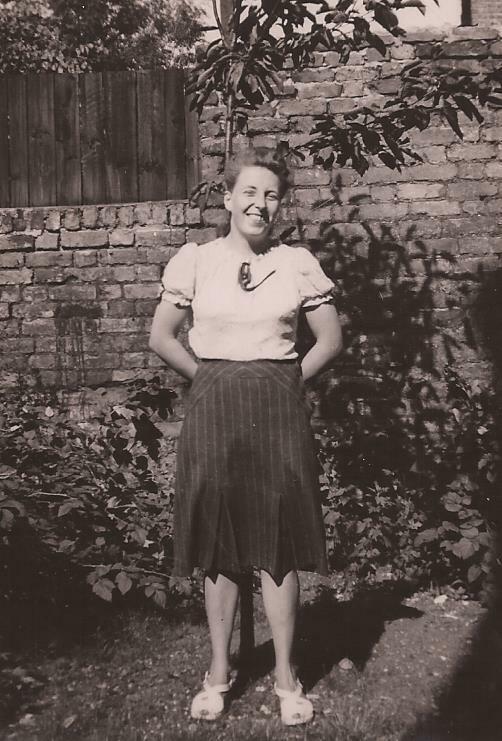 She’s there looking cheeky with her boyish brothers, and again as a young woman in a smart dark skirt and white blouse, smiling brightly, and it makes me wonder what the occasion was, maybe she was starting a new job? She is there as a bride, marrying my father, with evidently, and mercifully, no clue as to the bitterness he would eventually bring her. There are pictures of her at office parties, and on holidays with people I don’t recognise. All these pictures together add up as a testament to her life as a beautiful and vibrant woman. Now, at 92, she retains her beauty, but some of that vibrancy is lost. Old age is a dreadful thing, and something we all face, its limitations are both bewildering and frustrating, and ill health and aching joints can make you irritable. When we meet older people who are suffering these difficulties, it’s easy to forget that they have led these amazing full lives, had jobs, children, experiences, hobbies, interests, just like we are having now. If like my mum, you have to give up the home that you have created over the years, albeit no longer suitable, or desirable, or that others may be less than impressed with, it is a wrench. A big wrench. And whilst it’s lovely to see her settling into her clean and tidy new home, and enjoying the company, we mustn’t forget that. Unfortunately, once we had taken what she needed we had to have the flat cleared. The house clearance chappy told us it would all just go to the dump – the furniture; cookware; washing machine; ornaments; records……and all the other bits and pieces – just disposed of without ceremony. ‘No-one wants this sort of stuff now, you can’t give it away’ he told us, and I’m sure he’s right. Still seems criminal though. After this experience, I’ve promised myself I’ll reassess my own home. Clear out all the stuff that I’ve collected in cupboards and kept in the loft. I don’t want my children to have to face clearing it out and having to live with the guilt of throwing away all those memories, no matter how sentimental and tatty they think they are.